The library now has passes to the Mt. Kearsarge Indian Museum! Each pass admits a group of up to four people or a family of adults and their children any day except special events. For more info on the museum, go to indianmuseum.org. Passes to The Fells will be here soon. Browse, borrow, and enjoy titles from the New Hampshire State Library digital collection at https://nh.overdrive.com/ or try Libby, Overdrive’s new app for enjoying ebooks and audiobooks! This is a free service to library cardholders – log in with your patron barcode. Keep up with the latest purchases on the NH Downloadable Books blog. The Kindle is preloaded with e-books read for you to read. Call for more information or check it out the next time you are in. Gentle Flow Yoga Class is cancelled for Tuesday, April 23rd. April’s Book Group will be reading Home Fire by Kamila Shamsie. Book Group meets the 4th Monday of the month at 7:00pm at Salisbury Free Library. Been reading for the Flume or Isinglass awards (the book award by and for NH teens)? It’s time to vote! Votes are due in by the end of April! The library is in need of 10” potting plants and potting soil. The plants in the library have become overgrown and needed some TLC. Any help or donations are always appreciated. Yoga, Gentle Flow at Salisbury Free Library: Wednesdays 8:30 am – 9:30 am. Suggested donation of $8 a participant. Tuesdays 7:15 – 8:15pm for a suggested donation of $5 a participant. Special Thanks to Simon Brooks and CLiF for a wonderful event in November. 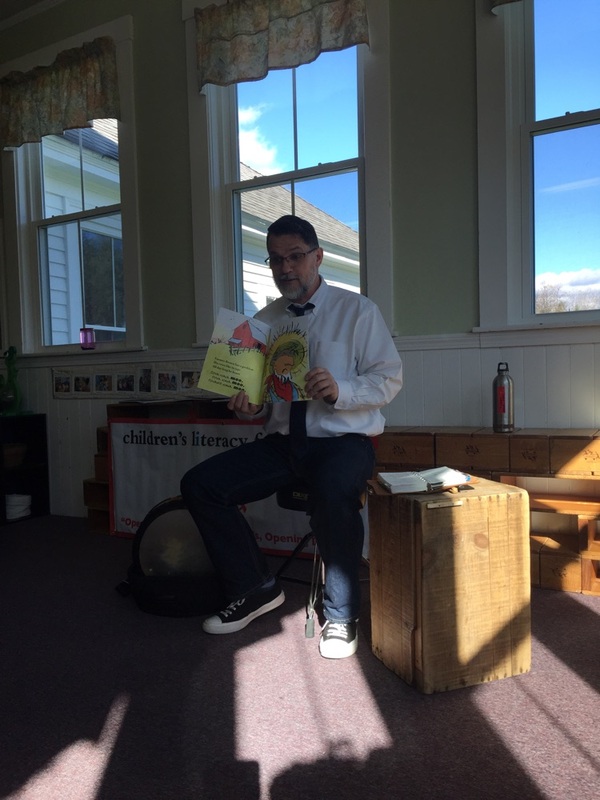 Thirty children around from the ages of birth to five received two books each and participated in a special story time at East Andover Village Preschool. Salisbury Elementary School was also visited the same day students participated in a special storytelling assembly and witnessed the school library awarded $500 worth of books and the public library $2000. Library Bags! $10 each, to benefit the library! We only have five left in green! Closings of the Salisbury Free Library due to weather are reported via the WMUR closings system.